Some cool new patents emerged this month, but the real news seems to be on the legal side, with a new Chief Judge for the PTAB named and more news from the Apple/Qualcomm lawsuits. Let’s take a look. After serving for nearly 6 months as acting Chief Judge for the PTAB, Scott Boalick was given the permanent position as of March 13, 2019. Boalick has been on the Board for the past twelve years and is looking forward to his new position. Another change on the Board is approval of Jacqueline Bonilla, named as Deputy Chief Judge. Bonilla also has been acting in this capacity since September of 2018. Both Boalick and Bonilla have been instrumental in the reforms that the Board has enacted over the past year in helping ensure proceedings work in balanced manner and helping to continue expedited appeals. A lawsuit was filed by Qualcomm against Apple Inc. in summer of 2017 pertaining to patent infringement on three counts. The verdict was returned last month and was found in favor of Qualcomm. The verdict comes with a $31.6 million payout from the technology giant. Apple’s infringements include an iPhone enhancement for flashless booting, a method for enabling quicker data recovery, and a way of improving gaming graphics while increasing battery life. These improvements were used in the iPhones 7, 7+, 8, 8+, and X. While this is good news for Qualcomm, now they are back to facing the verdict recently passed down against them from the International Trade Commission. Of course, not all news this month is related to patent law. The Japanese motorcycle giant is making great strides in improving safety for their vehicles. 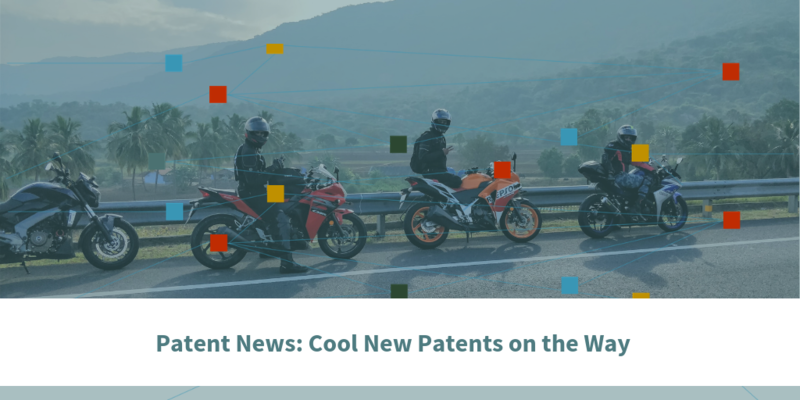 The patent that Suzuki has just filed in their home country indicates that they would like to place radar reflectors in specific places around motorcycles that will increase visibility to other vehicles. Along with the recent development of ADAS (Advanced Driver Assist Systems), Suzuki is hopeful that their new technology can help protect two-wheelers from potential collisions, making them safer and more insurance friendly. 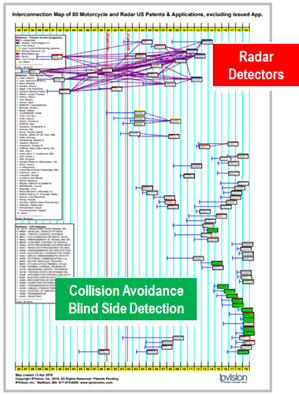 The citation cluster at the top are patents relating to radar detectors on motorcycles. The green colored patent boxes are patent applications related to object detection, blind spot detection and collision avoidance. While Sony’s existing PSVR headset doesn’t currently have an eye-tracking feature, many believe the next iteration will. To prepare, it seems Sony has now patented a pair of eye-tracking eyeglasses for glasses wearers, so they can also enjoy the equipment without trouble. The patented eyeglasses will communicate eye movement wirelessly to the headset, which can then adjust images in response. Talk about thinking ahead in order to make new technology accessible to all!